HOTEL GRAN PLAZA aims to respect the privacy of customers and users of its website and social networks and to protect the personal data that may have been provided through any form of contact with our hotel chain. For this reason HOTEL GRAN PLAZA has implemented the necessary security measures, both technically and organizationally, required to ensure the security and integrity of the personal data of our customers, thus preventing loss and unauthorized treatment or access in accordance with current legislation in the area of data protection. In this regard, and in accordance with the provisions of Regulation (EU) 2016/679 of the European Parliament (GDPR), below we detail information regarding the processes that HOTEL GRAN PLAZA carries out on your data. ONLINE RESERVATIONS: By filling in the online Reservation form, the user accepts and authorizes HOTEL GRAN PLAZA SL to automatically use and process the personal data provided for the purposes of administering the requested reservation and to provide the contracted accommodation service. 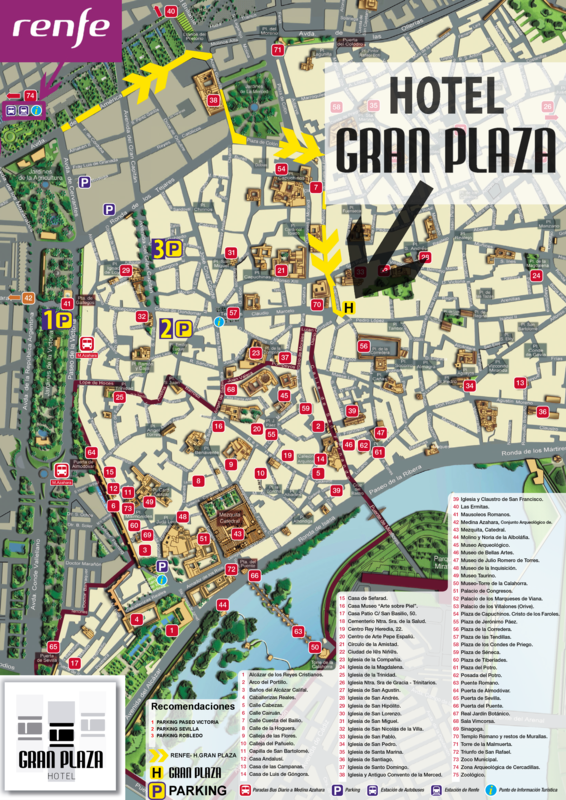 If the user has expressly consented to receive commercial communications by checking the box on the form relating to the receipt of publicity regarding the services and offers made by HOTEL GRAN PLAZA their personal data will be further processed to provide them with information regarding our news and offers by email. Similarly, the user is informed that when they make a reservation, their personal data and that relating to the reservation will be passed to the companies that make up HOTEL GRAN PLAZA which are involved in the management of the reservation and the execution of the same for the purposes previously described. CONTACT FORMS: By filling in the contact and opinion form on the website, the user accepts and authorizes HOTEL GRAN PLAZA SL.to use and process the personal data provided in order to respond to requests, suggestions and complaints, as well as to improve the quality of service. For the proper attention of and answer to the communication, your personal data may be transferred to companies of the HOTEL GRAN PLAZA group in order to give the most appropriate response to the request. Thus, if you authorize your subscription to the HOTEL GRAN PLAZA newsletter, we will provide you with information about our services and news through email, SMS and telephone calls. The data processed for commercial purposes will be kept until its deletion is requested. The user can revoke the consent for the processing of their personal data at any time by sending an email to protecciondedatos@hotelgranplaza.es. No data will be transferred to third parties, except for companies belonging to HOTEL GRAN PLAZA to providers that provide services on our behalf and in compliance with any legal obligation. The data passed to companies within the group itself will be transferred with the purpose of being able to share the necessary information for the proper provision of the service. Anyone has the right to obtain confirmation of whether HOTEL GRAN PLAZA is processing their personal data. ACCESS TO YOUR DATA: You will be able to consult the personal data held in HOTEL GRAN PLAZA files. RESTRICTION OF PROCESSING: You can request the restriction of processing in the following cases: a) while the accuracy of contested personal data is checked b) when the treatment is unlawful but you object to the deletion of your data c) when the HOTEL GRAN PLAZA does not need to process personal data but you need the same for the exercise or for the defence of claims d) when you have opposed the processing of your personal data. To exercise these rights you must send and email accompanied by a copy of your national identity document protecciondedatos@hotelgranplaza.es or to the postal address: Hotel Gran Plaza C/ Rodriguez Marín 5 CP: 14002 Córdoba. In any case, the user has the right to file a claim with the Spanish Data Protection Agency if he or she considers that any right relating to the protection of his/her personal data has been violated or if he/she considers that the processing of personal data concerning him/her infringes Regulation (EU) 2016/679 of the European Parliament.